An OSG reader, Rebecca, asked me if I could recommend some cooler-friendly Oh She Glows recipes she could take on the road for an upcoming camping trip. This question has been a popular one over the years, so I thought the long weekend would be a great excuse to brainstorm a list of camp- and travel-friendly foods to inspire you! In my early twenties, I would “camp” (I use that term lightly!) pretty regularly, but the food my friends and I packed in those days was a little different from what I stock my cooler with today. Okay, A LOT different! Lol. Back then, as long as I had potato chips and fruity coolers, I was a “happy camper”! Oh to be 21 again. Don’t worry, though, I’ve accumulated a few years of wisdom since then. I consulted OSG’s recipe tester Nicole to help put this post together as she often travels with my recipes in tow. I think the two of us have come up with some fun ideas for you! As always, please feel free to chime in with your tips and tricks too. The recipes below can all be made in advance, and many of them also tend to keep well in minimal storage without too much fuss. At the bottom of this post I also recommend some tasty store-bought options for when you don’t have time to make everything you might have hoped to for a trip…because if you’re anything like me, you’ll probably find yourself scrambling at the last minute to get everything ready! I love making pre-portioned single servings of dry Vegan Overnight Oats packets to take with us on trips. 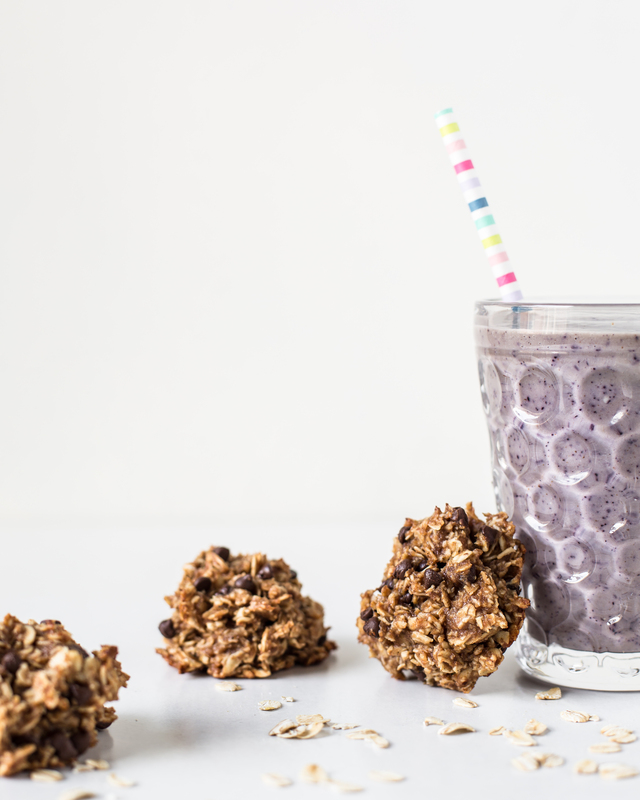 Simply bring a few single-serve, shelf-stable plant-based milks along and mix them in with the oat packets when ready to enjoy. Looking for eco-friendly reusable bags? Check out these reusable velcro pouches shown in the photo above. 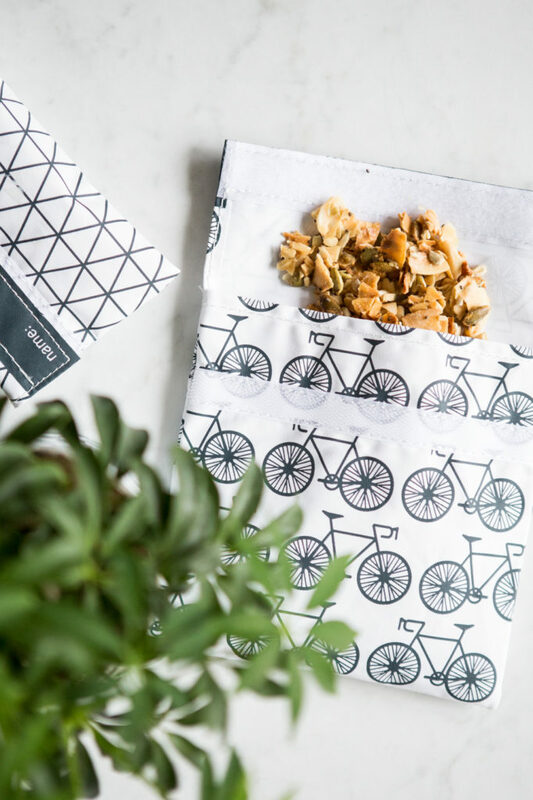 We love munching on my Ultimate Nutty Granola Clusters (The Oh She Glows Cookbook, p. 31) and my Roasted Hazelnut-Almond Granola Clusters (Oh She Glows Every Day, p. 71) when traveling, plus these clusters should keep fresh in an airtight bag or container for a few weeks. Bring your favourite fruits and veggies, choosing varieties that tend to travel well and don’t mind sitting at room temperature—this should help save cooler space for other meals that require refrigeration. Apples, oranges, firm avocados, and cucumbers are usually safe bets. Avoid thin-skinned fruit like peaches or pears as they tend to bruise easily. Energy-dense dried fruits are another great option for camping! Dried apricots, mangoes, and cherries are some of my favourites. 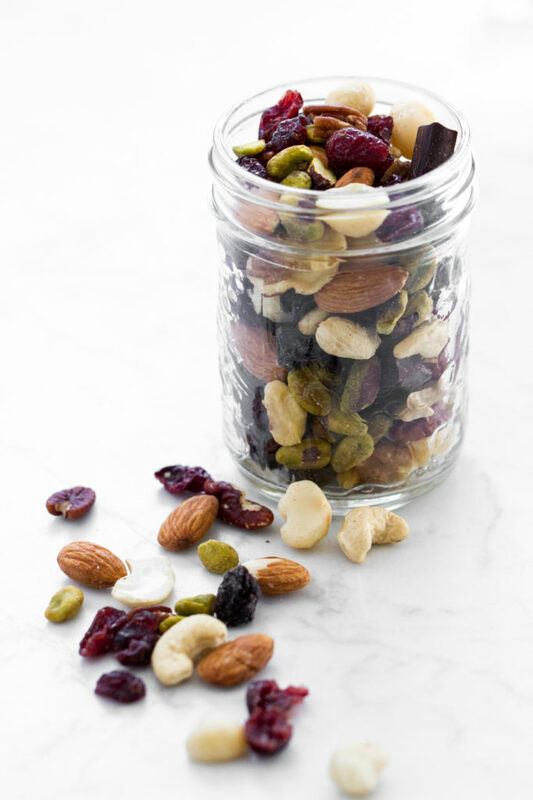 You can also make a DIY trail mix by adding dried fruit like raisins and dried cranberries to a container with your favourite mixed nuts. I love having a good seedy cracker on hand for snacking. 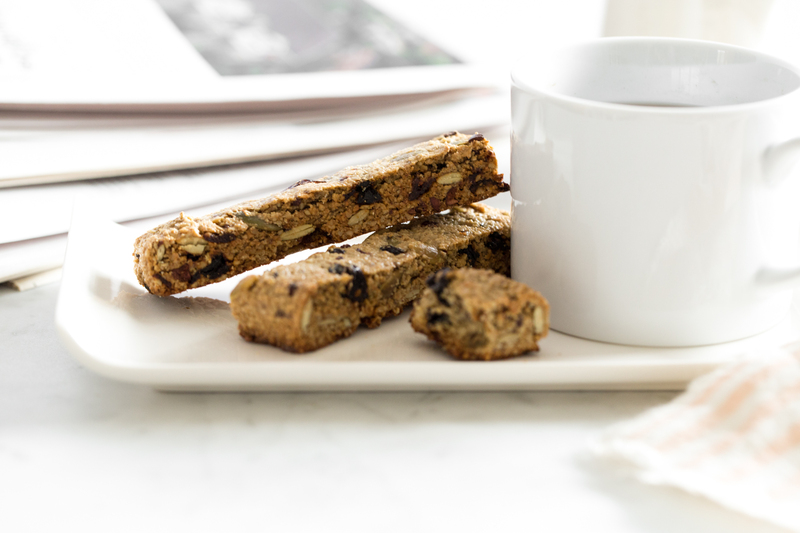 My Endurance Crackers are hearty, filling, and energizing! Just be sure they’re packed on top of other foods so they don’t get crushed by anything in transit. 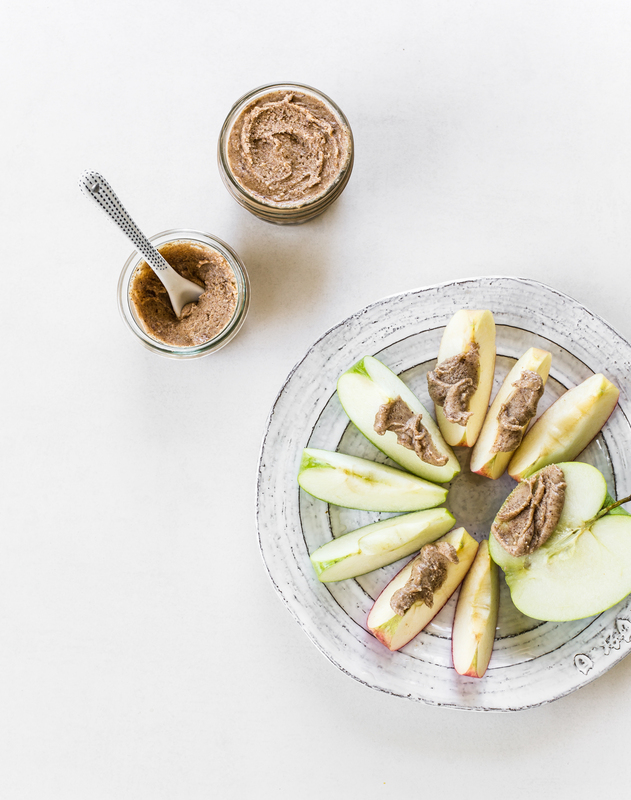 Bring a container of nut or seed butter and a small pouch of hemp hearts for a satisfying, protein-packed snack that needs no refrigeration. 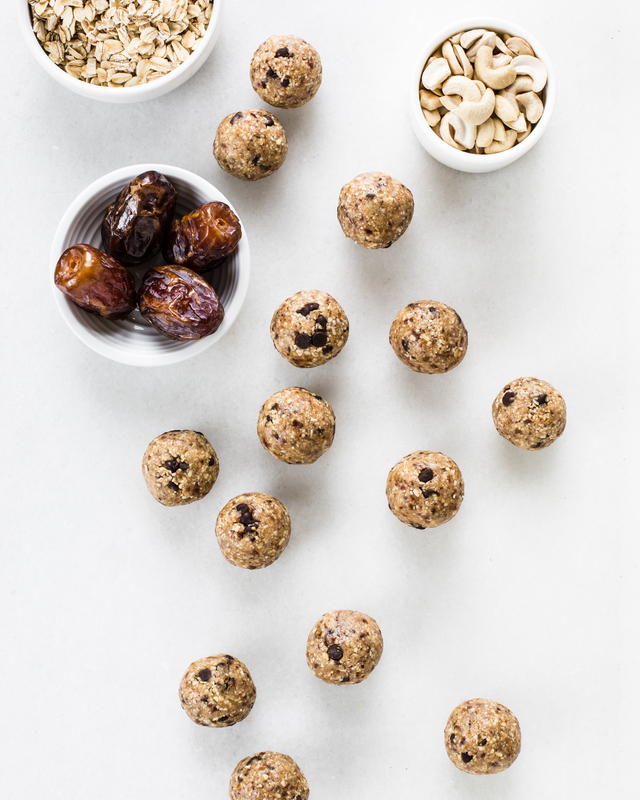 My Dark Chocolate Cherry Energy Bites, Cookie Dough Balls V (Oh She Glows Every Day, p. 93), and Triple Almond Energy Balls are perfect to munch on between meals. For another option, try my Classic Glo Bars (from The Oh She Glows Cookbook, p. 215), or Feel Good Hearty Granola Bars—those two tend to be big hits as well. Nicole recommends the Mocha Empower Glo Bars (Oh She Glows Everyday, p. 69), saying: “Away from home for 10 days with a toddler? You may need that invigorating combination of chocolate and espresso!” Haha. Speaking of coffee and tea…I’d love to hear your tips on camping while still getting your coffee fix. Please share your method if you have one! Maybe a make-ahead DIY Coffee Concentrate could work? 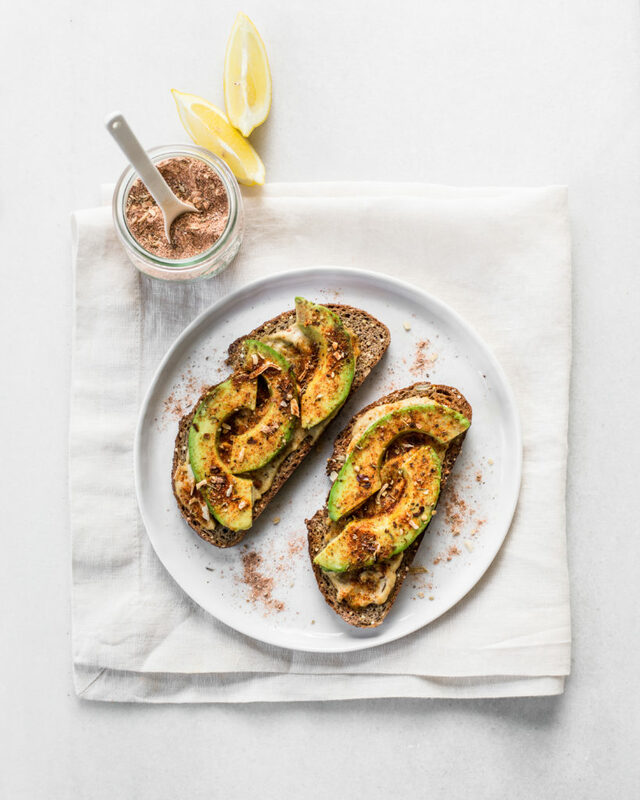 The 9-Spice Avocado Hummus Toast (Oh She Glows Everyday, p. 39) is a great light meal option! 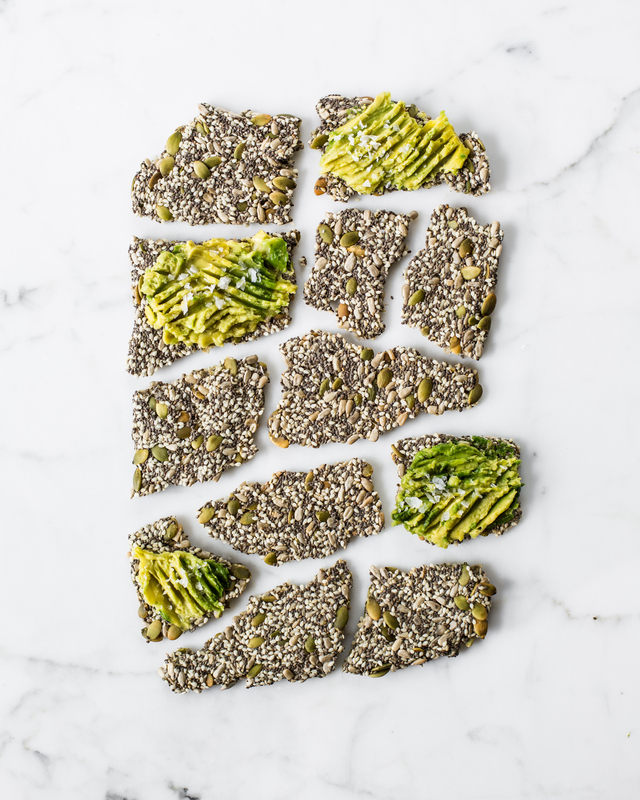 Serve it with Super Power Chia Bread (The Oh She Glows Cookbook, p. 229). Pack a few avocados, a small container of 9-spice Mix, and hummus (keep chilled) for a quick meal. Ifyou don’t have time to make the power bread, just pack a few of your favourite wraps from home. I love Wrap It Up Raw’s flax wraps—they freeze wonderfully too. If you have a really good cooler situation going, you could also consider making a salad/soup—my Chickpea Salad and Go-To Gazpacho (also found in Oh She Glows Every Day, p. 147 and the app) both travel well. The gazpacho can be guzzled cold straight from a mason jar—super refreshing! If you’re able to bring a bag of salad along, you could whip up a jar of my Shake and Go Balsamic Vinaigrette (Oh She Glows Every Day, p. 273) as well. Tetra Paks of baked beans always work in a pinch (and you don’t need a can opener or a cooler!). 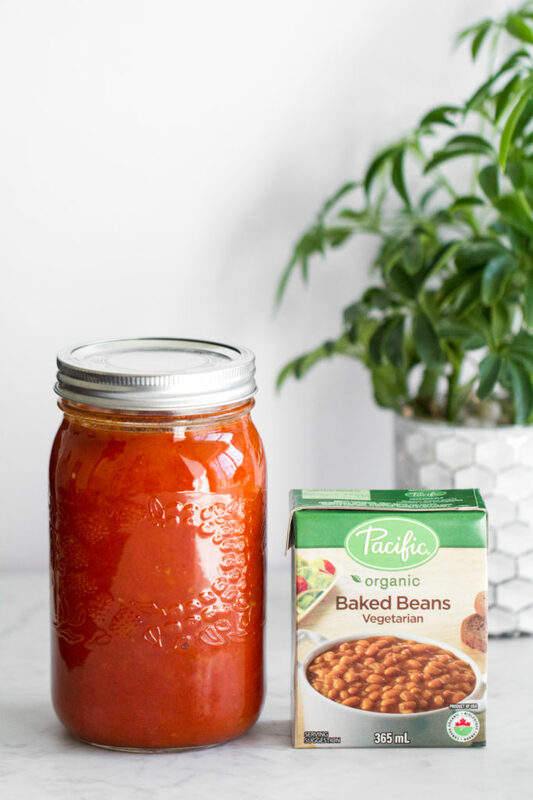 I love these Vegetarian Baked Beans by Pacific brand. Another idea is to pack the ingredients for a super easy balsamic chickpea salad. Bring some small Tetra Paks of chickpeas (I buy Pacific brand), balsamic vinegar (or any vinegar you love), olive oil, salt, and pepper. Bring along a collapsible strainer and a bowl, and you’ve got the gear for a quick salad: simply drain and rinse the chickpeas then add them to the bowl along with the vinegar, olive oil, salt, and pepper (to taste). My Flourless Thumbprint Breakfast Cookies, Blissful Basil Power Biscotti, and Banana Bread Muffin Tops can all be made ahead and frozen. Our editor, Terra, packed the Banana Bread Muffin Tops for mountaintop snacking on her month-long hiking trip through Switzerland. Terra added a touch of rosemary oil (which she uses as a natural preservative) to the batter, and the tops kept beautifully during her trek! Running out of prep time before your trip? Here are some store-bought plant-based foods that should keep well through your travels! Can you tell us a bit more about the rosemary oil? Did she infuse cooking oil with rosemary, or did she use essential oil? How much did she use? Thanks for this post! Hey Jessica, Terra said she estimates that she added about 1/4 to 1/2 teaspoon of rosemary essential oil (but she didn’t measure it) to the apple sauce she used in place of virgin coconut oil, then mixed and baked as instructed. :) Hope this helps! Great advice! I recently travelled Iceland with my fiance and two friends. We brought a cheap french press with us and bought a bag of coffee grounds. Then we just boiled water and brewed coffee every morning. It definitely made sense to bring since we were staying rurally without the option to buy coffee most mornings, and things are so expensive in Iceland that we probably saved $20/day between us by making our own coffee. I am a backpacker, so quick, easy to carry meals are super important in my world. My solution is my food dehydrator. Any time I have leftover soups, stews or chili, into the dehydrator it goes. I also dehydrate fruits and veggies to snack on. Marinara dehydrates beautifully, and angel hair pasta cooks up quick in the back country. For bread, I carry pita or sandwich thins, as they are sturdy and take up little space. Instant brown rice is also a staple in my camping gear. Mixed with dehydrated veggies and a packet of sweet and sour seasoning it becomes a quick stir fry over the campfire. We love bringing your recipes with us when vacationing or camping! Our family has two Celiacs, so we tend to bring our own food wherever we go. Our favorites from previous camping trips are definitely the Cookie Dough bites from The Oh She Glows Cookbook, and the Crispy Quinoa Cakes from this blog. I also love making your falafel and serving on it’s own, with some lemon-tahini dressing, or adding to mason jar salads with your Goddess Dressing. 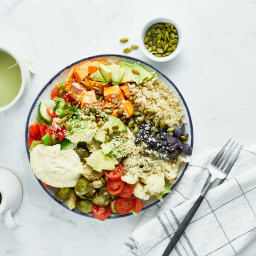 Another favorite is your Lightened Up Goddess Salad- I actually love this hot or cold, so I don’t mind it hanging out in the cooler for a couple days! Thank you Jenny!! That’s so great you’ve packed so many of the recipes! I agree with you on the goddess bowl…I always eat it hot when it’s first made (when the speltberries are warm) and then enjoy leftovers chilled. I’m not really a morning person and always need my coffee first thing. Some friends have recommended the Aeropress (sustainable with a reusable metal filter; good for travelling because small, easily portable, and made of plastic; many argue that it makes better coffee than my beloved French press). I’m ready to try one out! That’s so cool MEC has silicone cones! Pretty genius for camping. Do you find it imparts any flavour in the coffee? No, I’ve never found that! I have a silicon ice cube tray that seems to do that to what ever I put in it, but I’ve never noticed that the cone affects coffee. 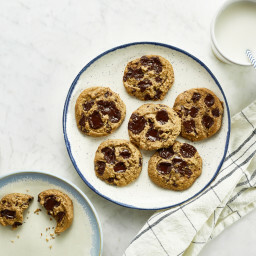 I wish you’d post more new recipes like minimalist baker rather than a collection of older recipes. I always look forward to a new recipe from you but lately I have been leaving your blog and app disappointed. Hi Lauren, Thank you for your feedback! We work so hard on all of our content so this is disheartening to hear, but I totally understand your preference for new recipes. It’s something I’ve been giving a lot of thought to and I appreciate you weighing in, especially as we’ve been trying a lot of new series over the past several months! I will keep this in mind going forward, thanks! I don’t know how you do what you do with two kids! You’re doing beautifully, I always look forward to reading your posts and appreciate highlights on old recipes because I forget about them all! Thank you Emily…what a sweet thing to say! Thanks for the tips! For the coffee, we bring ground coffee in a container and we use a Bialleti, on a grill over a fire or on a bbq, we always have a good and strong coffee to start our days! I also have made burritos (leaving off the avocado) and successfully warmed them on a skillet on the camp stove too. We usually get a box of vegan pancake mix that just needs water and have that for breakfast one morning. Overnight oats are a popular item too! Love these ideas Amanda, thanks for sharing! Never would’ve thought to bring a pancake mix..genius. Last year I made your veggie burgers ahead of time, then wrapped and froze them for our yurt camping trip. We ate them on the 2nd night by which time they had thawed, we reheated them quickly in a frying pan over a propane burner and were good to go. For coffee, we pre-grind coffee beans, boil water on site, and use a Java press like this one. I’ve also made cold brew, added a ton of ice, and packed it in an insulated growler when space wasn’t an issue. It stays ice cold all weekend! I like the idea of a concentrate, though I like my coffee strong, so I don’t want to dilute much. On cold mornings, I’d probably quickly reheat it in a pot. Oh yes I was wondering about the cold press option too. I hear you though I like coffee hot in the morning, even in the summer. Can’t wait to check out the Java! I’m so glad the veg burgers worked for you for your camping trip too. Here’s a coffee trick quite popular in some parts of Europe as an everyday method. Pre grind coffee beans into a container. Put your desired amount into your mug at camping and fill with hot water. Let it sit so the grinds settle to the bottom, a few minutes. Then add milk or sugar if needed, stir then let it settle again. You’ll have to be careful once you reach home the bottom of the mug but we love using this idea, it’s minimal and so easy. I suppose you could take a small strainer if you prefer! Wow, so easy!! I so need to try this. Thanks Margaret! Hi Angela, loving all the colorfull pictures in your updates . Thank you! And I totally see what you’re saying. Thanks for mentioning it as timing of posts is something I debate about a lot! Love your photos. They just make me to try out your recipe immediately. Thanks so much! Being on the run all day, I need something more than a green smoothie to keep me energized (I usually have an all-day sized green smoothie from your app or a double batch of your Green Matcha Mango Ginger Smoothie from Oh She Glows Everyday alongside *gulp* several cups of coffee!). The Bobble coffee press cup sounds so fun! I remember you mentioning this before and I’m off to google it now. I forgot to mention the best part…it keeps your coffee hot for absolute hours! I have to pop an ice cube into it if I want to drink any right away (I always want to drink it right away ha ha!) and the long heat retention is a life saver when chasing down kids or a deadline at work :) I just wish it came in fun colours. It does look sleek and professional, I admit. Thank you Angela for this great post! My husband and I are going camping with Arnaud , our 7 months old baby next week-end, so it’s relly helpful. We can tell you put a lot of love in this post. For coffee, we like to bring instang coffee from Starbucks (Starbucks via). It’s so good, it’s impossible to tell it’s instant coffee. While we don’t like this compagny and think it produces a little bit of garbage, it’s a compromise in camping to enjoy such a good hot beverage (especially after a night with a baby…!). Like Barb (in the comments above) we used to plan our meal with a dehydrator (we were then wild and free!). It’s such a delicious and cheap option. Legumes like chickpeas can dehydrate so weel. We made a version of your “Cream of tomato soup” (Oh she glows cookbook) this way with sun dried tomatoes and lot of dried herbs. 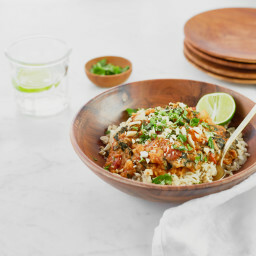 For a quick curry, we liked to use dried coconut milk powder. Hey Ann-Marie, Thank you for your kind words! And that’s such a good point about instant coffee…when you need easy it doesn’t get much easier than that. :) Wishing you a great trip with baby Arnaud! I hope he sleeps like a log for you (hehe). I signed up for the newsletter but I am not getting it and it is not going to my spam folder either. Thank you for these great suggestions! And, I love seeing everyone else’s comments/ideas too…our family goes tent camping several times throughout the summer and although we’ve got a pretty solid system down for set-up, equipment and meals, I’m always looking for new ideas. One thing I can say for sure…every camping trip we’ve taken the last 2 summers has started off with a big cold jar of your gazpacho and chick pea salad (and yes, a cold beer). Since we usually loosen up a bit with snack foods/sweet treats while camping, I like to make sure we at least start the trip off on the right dietary foot – and both the soup and salad travel and keep well. Side note – although we’re from the NYS, our favorite go-to camping spot is in Ontario!!! Thanks Angela, have a great weekend! Vegan food is good for health because there are a lot of health benefit of it. 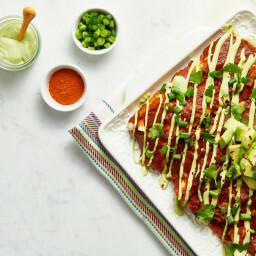 I always make vegan food for my child.Thank you very much for sharing some good recipes and tips. Trying to make Power Toast and Wraps. This is perfect! 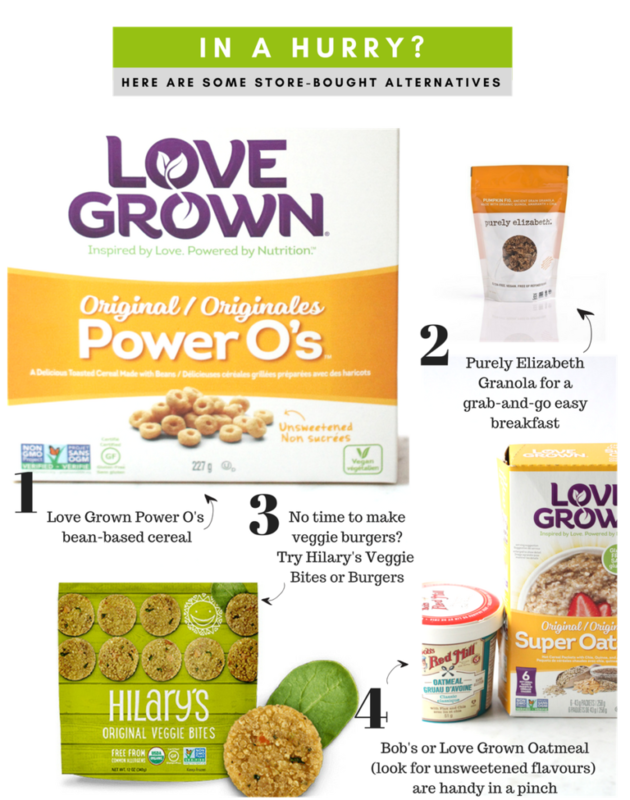 I’m always on the go and have trouble finding good vegan snack recipes! Thank you!! Thanks so much…I’m glad it’s helpful! Coffee! The Aeropress (lightweight and easy to clean) along with the Jetboil stove (it literally boils water in 2 minutes) are your best friends for camping. Pre-grind some beans at home and take the grounds with you. Throw some almond milk Bailey’s in there and you’re good to go! Sounds like you have your system down pat…love it. And almond Baileys while camping sounds like the ultimate luxury. nice! Good coffee is not optional in my life. I pack coffee grounds and the filter that sits ontop of your cup, pour hot water over it periodically. Massaged kale salad is a great make ahead to bring since it keeps fine in a cooler several days. And good call on massaged kale! I hadn’t thought of that. Last summer for a canoe trip (where I had a cooler), I made several of your recipes that worked great camping. First, I made your 5 Minute Pantry Dal and then also made some quinoa. At camp, I just heated then on my camp stove and they were great. I also made the pumpkin seed taco “meat” from your app. I brought a can of refried beans and some corn tortillas and made tacos. So tasty! When I go backpacking and have to worry about weight and whether things are perishable, I have made your Cinnabon granola. It is great with powdered milk or just plain. I’m not sure why it never occurred to me but packing single serve packets of overnight oats mix is a great idea for breakfasts when travelling! I usually like to have a little something to eat when starting my day and granola bars get a bit old fast. I’ll have to try this next time. Such a great round-up! 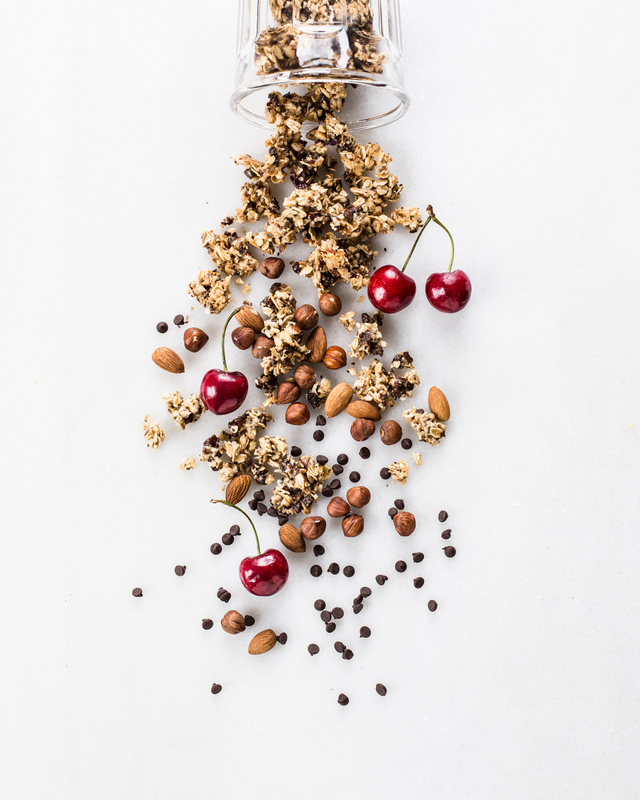 Granola is my go-to snack. Thanks for this post! I’m frequently ‘house sitting’ in a friend’s small urban apartment on order up visit my parents, (alas just Mum now because Dad just passed away). While away I try to make it a bit of a holiday in order to enjoy the waterfront view from my friend’s apt and not get stuck in her postage size kitchen. Something I always bring, which is very camping-friendly, are chia seeds along with a can of coconut mylk or other plant-based mylk. That way I can make chia seed pudding for breakfast or afternoon snack. Also, I’ve been bringing homemade baked beans sealed in mason jars for a hearty breakfast. Additionally, I find tempeh travels nicely and can be eaten just as is cut up into cubes for instant protein, or included in a simple stir-fry. Great tips. Thanks for sharing them!! I know I’m a bit late to the game and maybe somebody already mentioned it, but we recently got an Aeropress (around $40) for camping. I thought I’d use it just for camping since it’s plastic, small, light, and is – the best part – by far the easiest coffee maker to clean, but I now use it every single morning!! I immediately stopped with the French press and the Bialetti stovetop – it was just so much easier and quicker (boil water and steep the coffee for about 1-2 min only) and the coffee tastes great. The waste is limited to one really small paper filter for each use. The cons are that it only really makes one 80z cup of coffee at a time so it’s not great if you’re a multiple-giant-cups-of-coffee-in-the-morning type or if you need to make it for multiple people. However I can’t recommend it enough for camping. I really loved those snack ideas for camping! From now on i am always have some! 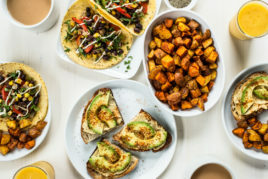 Previous post: Vegan Mother’s Day Brunch Recipes!